Pressure sores or infected pilonidal sinus resulting into sacral defect is a challenge in view of reconstruction frequently faced by a plastic surgeon. Many flaps have been proposed for the same out of which muscle and myocutaneous flaps are associated with better surgical outcome due to its durable coverage and superior blood supply. In this current study, we introduce a novel technique of partially de-epithelised Gluteus maximus myo-facio-cutaneous advancement flap cover for sacral defects resulting due to bedsores as well as pilonidal sinus. This study was conducted from April 2016 - April 2017, a total of 30 patients underwent reconstruction of sacral defects post pilonidal sinus excision as well as grade 3-4 bed sores. 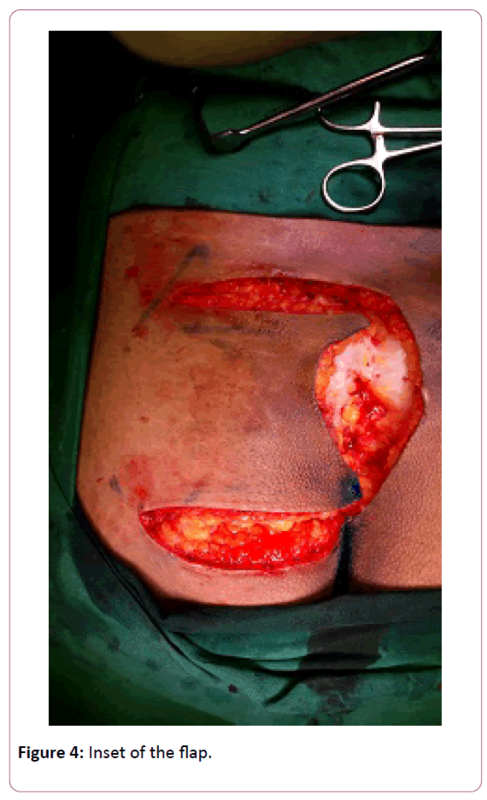 Post-operatively the flaps were evaluated in terms of incidence of flap necrosis, infection, rate of healing, aesthetic outcome and rate of recurrence. All 25 flaps healed with fair post-operative outcome with no significant complications. Thus, partially de-epithelised Gluteus maximus myo-facio-cutaneous advancement flap cover efficiently reconstructs sacral defects and proves to be a safe, durable option with excellent aesthetic outcome. Pressure sores or infected pilonidal sinus resulting into sacral defect is a challenge in view of reconstruction frequently faced by a plastic surgeon. Pressure sores are defined as tissue loss due to ischaemia from prolonged pressure over bony prominences they are also known as the bed sores or decubitus ulcer [1-2]. 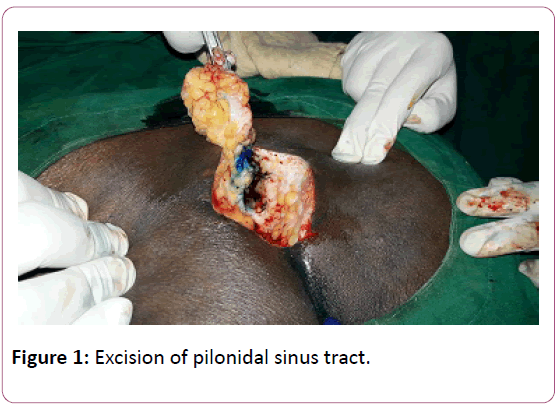 Pilonidal sinus after excision typically results in large defects due to its deeper tissue involvement (Figure 1). Figure 1: Excision of pilonidal sinus tract. Many surgical methods have been described for reconstruction of sacral sores- such as primary closure, skin grafting, local flaps as well as muscle flaps. Muscle and myocutaneous flaps provide successful coverage for pressure sore and hence treatment of choice for the same. They provide excellent blood supply and durable coverage. The gluteus maximus myocutaneous flap is a versatile option for reconstruction for sacral and trochanteric pressure sores with reduced recurrence [3-7]. Conversely, limited shifting capacity, excessive blood loss and sacrifice of the muscle are the major drawbacks of this procedure. In this current study, we propose a modification of traditionally used gluteus maximus advancement flap i.e. partially de-epithelised gluteus maximus myo-facio-cutaneous advancement flap cover. The advantages being simpler and faster operative technique with high rate of successful reconstruction in terms of sacral defects and minimal complications. A prospective observational study was conducted at our institute from April 2016-April 2017, including 30 patients who underwent reconstruction for sacral defects resulting from pilonidal sinus excision as well as grade 3-4 bed sores. Out of 30, 17 were men and 13 were women with mean age 59.8 years (range: 22-72 years). The flap size ranged between 7 X 6 cm and 12 X 14 cm. A total of 30 flap procedures were performed out of which 23 were for pressure sores and 7 for pilonidal sinus. They were followed up for a mean period of 12.8 months. All the patients were operated in a prone position. A hand-held Doppler assessment was done pre-operatively to locate the gluteal perforators and the flaps were marked as gluteus maximus advancement flap. The ulcers were debrided till the exposure of healthy tissue. For Pilonidal sinus, the entire tract was marked by using methylene blue and excised totally. The gluteal maximus advancement flap was designed appropriately so as to achieve tension-free coverage of the defect. The incision was made according to the marking and then continued down through the skin, subcutaneous fat and fascia to the muscle (Figure 2). Figure 2: Marking of the flap. The raised flap consisted of a part of gluteus maximus muscle, 1.5-2 cm, depending upon the size and depth of the defect (avoiding the usage of entire muscle bulk) along with the fascia, the adjacent subcutaneous fat and the skin cover (myo-facio-cutaneous flap) (Figure 3). Figure 3: Raised flap with partial thickness of gluteus maximum muscle. The dissection was done from medial to lateral towards the marked gluteal vessels and perforators. After adequate dissection, the medial edge of the flap was partially de-epithelised, 2 cm from the margin so as to achieve tunnelling of the flap under the defect and to obliterate the potential dead space. All donor sites were closed primarily. Closed suction drains were placed at the operative site for 2 weeks post-operatively. Gradual mobilization was started for all patients after 3 weeks. A Low-residual diet was given for 1 week and strict perineal hygiene was maintained. A total of 30 patients were studied, who underwent reconstruction using the partially de-epithelised gluteus maximus myo-facio-cutaneous advancement flap cover; out of which 17 were men and 13 were women. The mean age was 59.8 years (range: 22-72 years). The flap size ranged between 7 X 6 cm and 12 X 14 cm. All the flaps were elevated within 1 hour due to ease of the flap design. There were no ulcer recurrences in any of the patients. All patients achieved complete healing of the donor site with fairly good cosmetically acceptable scar (Figure 4). Figure 4: Inset of the flap. Common causes of sacral defects include pressure sores in paraplegic patients and infected pilonidal sinus in ambulatory patients. Delayed wound coverage of a sacral defect can cause progressive infections and wound pain. Thus, thorough debridement followed by reconstruction of the wound with flap cover is the best treatment. The gluteus maximus myocutaneous flap is the most popularly used reconstructive option for sacral defects due to its reliability and easy operative technique. However, a disadvantage being a functioning muscle has to be sacrificed, which could result in walking instability. Other disadvantages are bulky appearance, limited flap transposition and inevitable blood loss while splitting the muscle. Also cases where the suture line of the bilateral gluteus maximus myocutaneous flaps lies in midline where the pressure is maximum resulting in wound dehiscence . The main concern in reconstruction of the pressure sores in non-ambulatory patients is higher rates of recurrence. The previous studies reported recurrence rates of up to 77.1% Disa et al. reported 61% recurrence rate in their study of 66 patients within mean follow-up of just 9.3 month. With the newer reconstructive options of perforator flaps, the island flaps for coverage of sacral pressure ulcers are being focused (Figure 5). Figure 5: Closure of the defect. The skin paddle used can be elliptical and the donor site can be closed primarily . The major advantage of these flaps is they preserve gluteus maximus muscle when used for coverage of a pressure sore. However, reuse of the flap is not possible if recurred. Myocutaneous flaps are of great importance in reducing the rates of recurrence as they provide adequate padding for pressure points, but also have limitations that they undergo trophic degeneration with time, technically demanding surgical procedures and donor site morbidity in ambulatory patients . We propose a technique which combines both fasciocutaneous flaps and myocutaneous flaps. The muscle is harvested partially unlike classic gluteal myocutaneous flaps. 30-40% of the gluteus muscle was harvested from its medial portion while conserving the lateral portion. It provides sufficient muscle coverage and at the same time avoids donor site morbidity . Due to its easier surgical technique, the required operative time is less (Figure 6). Figure 6: Cosmetically superior healed suture line. De-epithelialisation facilitates the entrance of the flap into the ulcer cavity to obliterate the dead space, form a cushion over the bone, facilitate the deep sutures that will obviate the tension over the skin, and allow more muscle bulk with high vascularity to get inside the ulcer directly over the bone. Gluteus Maximus advancement as well as the rotation flaps remains standard flaps for sacral pressure sores reconstruction. We propose a modification of classic gluteus maximus advancement flap with three major advantages - easier technique with a flap design allowing mobilization equivalent to the classic design, improved vascularity rendering the flap more robust and its better ability to withstand pressure induced ischemia and finally, the cosmetically acceptable donor-site scar renders it as the choice of treatment. Wong T (2006) Comparison of gluteal fasciocutaneous rotational flaps and myocutaneous flaps for the treatment of sacral sores. International Orthopaedics (SICOT) 64-67. 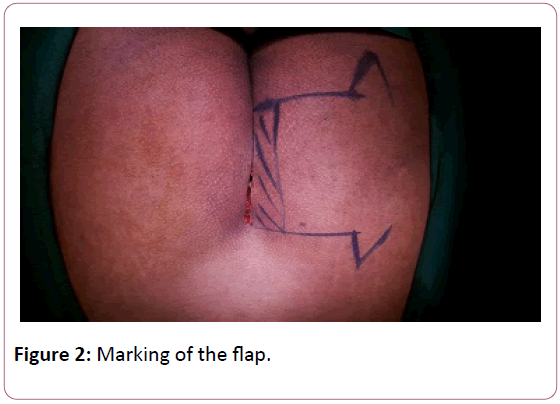 Wong C (2007) The perforator-sparing buttock rotation flap for coverage of pressure sores. PRS J 119: 1259-1266. Albarah A (2012) De-epithelialized biceps femoris myocutaneous V-Y advancement flap for ischial bed sore reconstruction. Egypt J Plast Reconstr Surg 36: 181-186. Mostafa W (2012) Inferior gluteus maximus myocutaneous flap for reconstruction of ischial bed sores. Egypt J Plast Reconstr Surg 36: 201-208. Lin C (2014) Modification of the superior gluteal artery perforator flap for reconstruction of sacral sores. J Plastic, Reconstructive & Aesthetic Surgery 67: 526-532. Nisanci W (2015) A new flap alternative for trochanteric pressure sore coverage distal gluteus maximus musculocutaneous advancement Flap Ann Plast Surg 214-219. Hyan H (2016) Combined V-Y fasciocutaneous advancement and gluteus maximus muscle rotational flaps for treating sacral sores. BioMed Research International.